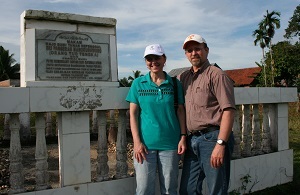 P. standing beside the fence around the engraved Karang Berahi stone. 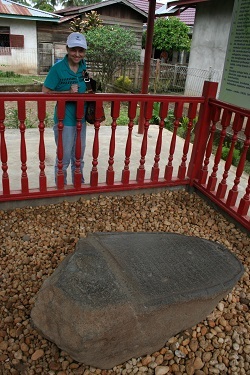 In the Village of Karang Berahi is an engraved stone, though not dated, is claimed by some to have been carved out between 608 and 686 AD1. The language used is the ancient Melayu language, and it being during the time of the Hindu Sriwijaya Kingdom, in many respects resembles ancient Sanskrit. 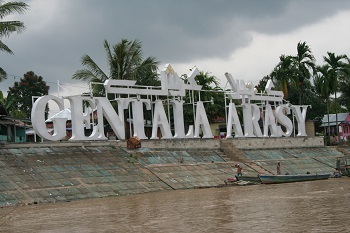 The one on the Island of Bangka called: Prasasti Kota Kapur. The the one from Lampung called: Prasasti Palas Pasema. The stone is located in Dusun Batu Bersurat, Village Karang Berahi, Pamenang Region of the Merangin Regency of the Jambi Province of Indonesia. The bridge you get to walk across to see the Karang Berahi stone. To get there, first drive to the 51 kilometer “mile marker” between the Cities of Sarolangun and Bangko. After arriving at this location, turn north off the main road and travel 1.4 kilometers. The road will dead end. You will need to leave your vehicle and walk to the east about 30 meters (100 feet). From there you will descend a concrete path to a swinging bridge. 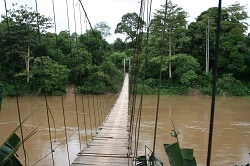 Yes,… you get to cross the narrow foot/motorcycle bridge to get to the Village of Karang Berahi on the other side of the Merangin River. From there turn left, and ask people in the village the stone’s location. It is only another 61 meters (200 feet). This stone has had a history of being moved about between its current location in the Village of Karang Berahi and the City of Bangko. The Karang Berahi stone is maintained in a well-kept park with a roof over it, but tragically exposed to the elements. Moved to the yard in front of the Dutch authority in Bangko. When the Japanese came, they granted permission for it to be moved back next the the mosque in Dusun Batu Bersurat. It is said that several children had a dream in which a person named Ulya came and commanded the stone to be moved from its position close to the mosque. In the dream, it was said that Ulya said a great catastrophe will take place in Dusun Batu Bersurat if the stone isn’t move away from the mosque. It was then moved to its current location. The stone’s writing, being a reflection of their ancestor’s Hindu religion, could have prompted the moving of the stone away from the mosque. 1Junaidi T. Noor, the author of Mencari Jejak Sangkala (pg. 28) says the engraving on the stone can be dated between 608 and 686 AD. 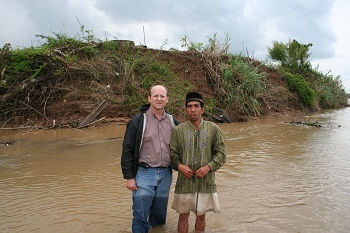 C. with the local man (Pak./ Mr. Sidol) who took him to the Island of Penaga in his boat. The small hill in the background is Pulau Penaga, where the Dutch ship is said to be buried. Northwest of the City of Jambi is a very small island that people in the surrounding villages claim has a Dutch ship buried under it. The story is that the ship either sank or the Dutch just abandoned it, and then through the process of time, sand from the Batanghari River covered it up as the river levels rose and fell. The local people couldn’t give us an approximate date of when the ship was supposed to have been last used. If the story is true, the date could be anywhere from when the Dutch first arrived in Jambi (1600-1700s), until they left during WWII. The oldest people in the village (in their 80’s) told us they never saw the ship, and that it was only a story that was circulated when they were still a child. The date of this building is posted just below the second story window (1937). For those traveling through the City of Muara Tebo and you’d like to take a short 30 minute break, you could drive through the small city to look at the old Dutch wooden buildings which are still in use. 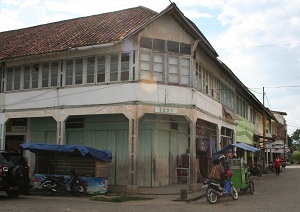 The buildings located in the very center of the city, called the pasar, or market, are all wooden buildings of Dutch architecture from 1930 era. As you drive around you will see that people are still living in homes and barracks that were at one time used by the Dutch solders and their families. Yesterday there were 2 Canadians who had taken a bus from Medan (North Sumatra) and were headed to Jakarta. They were using the Lonely Planet travel guide for their journey—no personal guide or translator. They got halfway through Jambi and realized this was not the adventure they had imagined. At a bus stop in Sarolangun, a friend of mine saw them, and though he doesn’t know English, he realized that they were quite distressed, not being able to communicate with anyone. He then called me on his cell phone and let me talk to the hapless travelers. In the City of Jambi, on the street Jl. 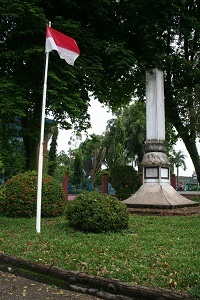 R. Mattaher, directly in front of the building named “Gedung Balai Wanita,” there is a monument that was erected in memory of Indonesia’s independence from all foreign colonial authorities (specifically the Dutch). The location of the monument can be found with this link. 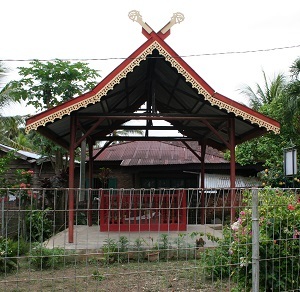 One site to see in the Village of Lubuk Landai is the grave of Pakubuwono III. The tombstone gives him the title of: “Rajo Bumi Tanah Sepenggal Sri Pangeran Mangkubuwono” (The King of the Earth in Tanah Sepenggal, the Honorable Prince Mangkubuwono).